There it was, sitting among apps for boosting productivity and planning a spring garden as I was browsing by. 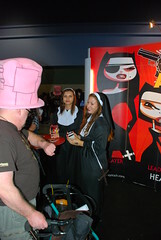 Nun Attack, the game, sporting an image of a gun-totin’ nun with a wicked grin. Really? Now free for the start of Holy Week? While no one makes a game as a theological statement, it’s striking that God is only tangentially related to the divine intervention here — if at all. 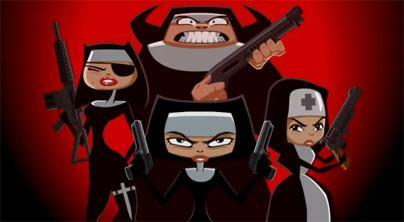 It’s really the nuns and their guns and superpowers (one for each of the four main characters) that are the main force. A full shop to get things rocking! I’ve never heard of “casting” a miracle before. Isn’t that usually an evil spell? This is a tangent: I believe that the violence and killing in movies, T.V., and especially video games is at least partly responsible for the level of murders and mass shootings in the country. For more than 50 years, the entertainment industry has been modeling and sending the message that when you get angry enough at someone, you grab a gun and shoot them. Thank God not everyone does this, but I think that statistically there is a certain percentage of people who are too emotionally unstable, under too much street, or lack sufficient self-control who will act out with violence as a result of being conditioned by the media. I don’t know why more people don’t see the connection.